When HP introduced the HP-35 Scientific Calculatorthe first scientific handheld calculatora small revolution took place in shirt pockets around the world. It began in the early 1970s, when HP co-founder Bill Hewlett, impressed by the small size of an arithmetic calculator he'd seen, became convinced that HP could expand the technology into a pocket-size calculator capable of performing trigonometric, logarithmic and exponential functions. The result was the HP-35 Scientific Calculatora product that fundamentally changed the way engineers, scientists, mathematicians and students worked and banished the slide rule to the history books. A marketing study done in early 1971 warned HP that there was a small market for a pocket-sized calculator with scientific and mathematical functionalityit also recommended that the new calculator be the size of a typewriter or adding machine. But Bill Hewlett was convinced that engineers would prefer a calculator that would fit into a shirt pocket. Bill was right. In the first three years after its introduction in 1972, sales of the HP-35 Scientific Calculator exceeded 300,000 units. The little "electronic slide rule" weighed only nine ounces (255 grams). Named for its 35 keys, the device made it possible to make complicated calculations in the field and on the road with the speed and accuracy that surpassed that of a slide rule. It sold for $395 (U.S.). "I did everything I could to set deadlines and break logjams," said Bill Hewlett in a 1976 interview. "Actually, from the time the product was designed until it was introduced covered less than a year. There was tremendous esprit de corps and excitement." Before the introduction of the HP-35 Scientific Calculator, most people calculated more complex mathematical operations with a slide rule. If you were born after 1960, chances are you've never used a slide rulemaybe you've never even seen one. Earlier calculators were nicknamed "four-bangers" since they handled only four functions: addition, subtraction, multiplication and division. The HP-35 Scientific Calculator not only performed complex scientific and mathematical functions, but it was also the first calculator to use "Reverse Polish Notation" for programming efficiency. Special processes and devices involved in the project, which were new and high risk at the time, included LEDs (light-emitting-diodes) and MOS (metal-oxide-semiconductor) ICs (integrated circuits). Some of the thousands of the HP-35 Scientific Calculators sold were involved in explorations and adventures. One was carried high upon the rugged slopes of Mt. Everest; one survived a trip through a snow-blower in freezing temperatures; others helped navigate ships. Some have been used by astronauts aboard spacecraft to calculate the exact angle of re-entry into the Earth's atmosphere. 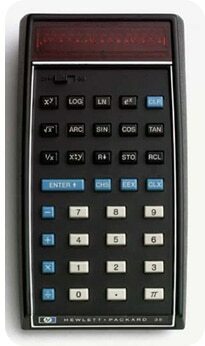 Successors to the HP-35 Scientific Calculator include the world's first pocket-sized business calculator (HP-80 in 1973); the first fully programmable handheld calculator (HP-65 in 1974); the first handheld with continuous memory (HP-25C in 1976); and the first calculator that displayed both numbers and letters (HP 41-C in 1979). Dave Hicks, an Oregon-based engineer for the Intel Corporation is such an HP calculator fan, he owns every HP calculator model ever made. His enthusiasm for HP calculators has inspired him to create an online "museum" for HP calculators. In addition to detailed information about HP calculators, the site has historical information about calculating machines and slide rules, FAQs, classified ads and information on resources of interest to calculator owners. HP continues to be first to market with innovative calculator products that allow increasingly greater speed, accuracy and complexity in problem-solving ability, leading the way in calculators for business, finance, science and graphics.